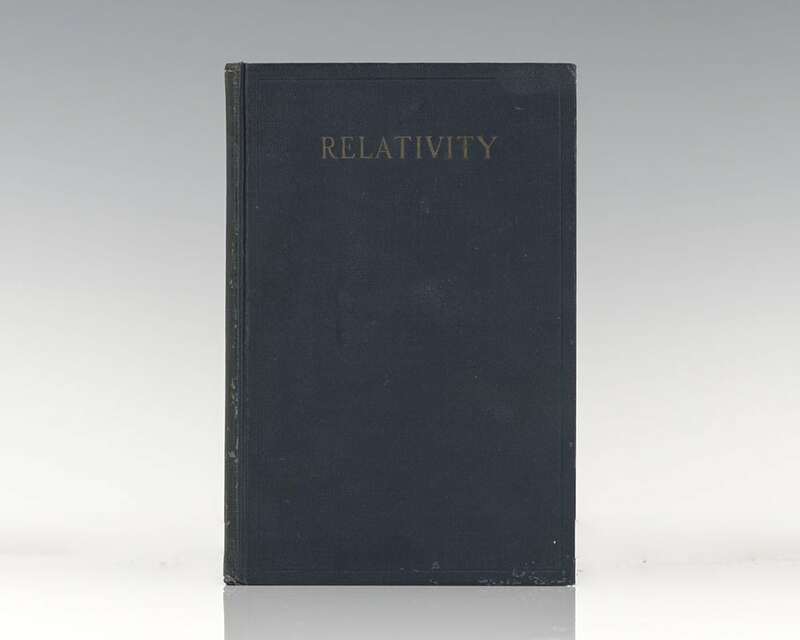 Relativity: The Special And General Theory. New York: Henry Holt and Company, 1920. 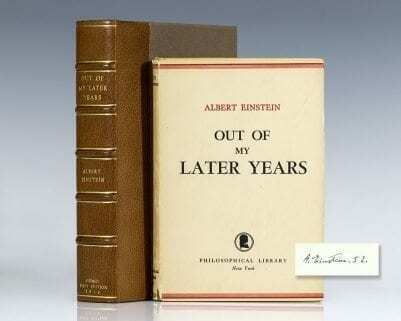 First edition of Einstein’s ground-breaking work. Octavo, original blue cloth. Signed by the author on the half-title page, “A. 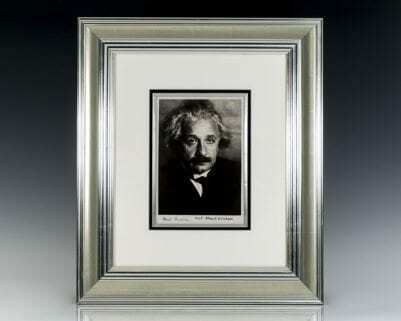 Einstein 50.” In near fine condition with light rubbing and wear. Translated by Robert Lawson. Housed in a custom half morocco clamshell box. 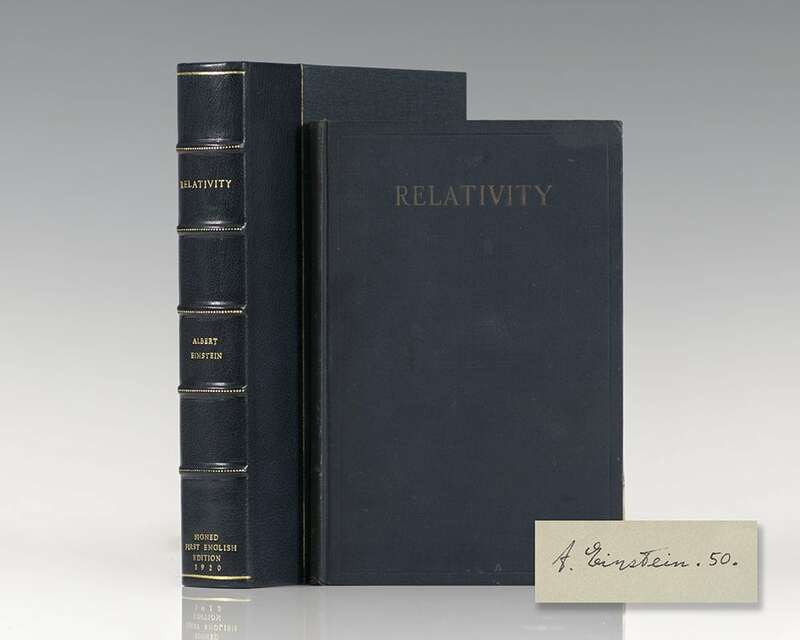 First editions signed by Einstein of this cornerstone of scientific thought are exceptionally rare. It can hardly be disputed that the theories put forth in this book are among the most important in the history of modern science. "The imprint of Einstein's work on the different areas of physical science is so large and varied," writes Gerald Holton in a recent assessment, "that a scientist who tries to trace it would be hard put to know where to start" (Simmons, The Scientific 100). Out of My Later Years. New York: Philosophical Library, 1950. 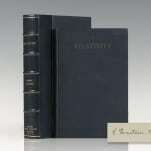 First edition of Einstein’s collection of social science-related articles, addresses and speeches. Octavo, original cloth, frontispiece of Einstein. Signed by Albert Einstein on the front free endpaper. Fine in a very good dust jacket. Housed in a custom half morocco clamshell box. 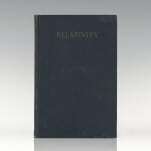 First edition of Einstein’s collection of social science-related articles, addresses and speeches. Octavo, original cloth, frontispiece of Einstein. Signed by the author on the front free endpaper, “A. 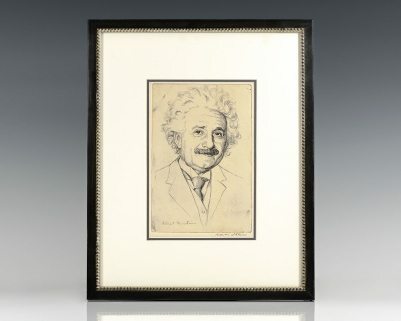 Einstein 52.” With the ownership signature of Dr. Milnor Alexander, Los Angeles, California, 1952 on front pastedown. Alexander taught political science at Penn State University and was active in the women’s movement and supporter of many societies promoting social welfare, the environment and the Labor movement. 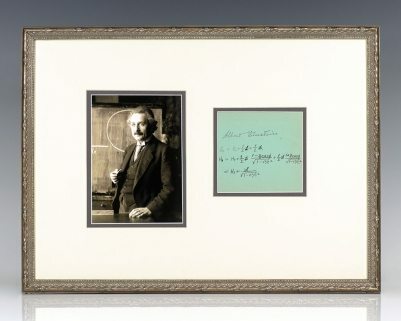 She has also inscribed below, “Autographed by Einstein for our fund-raiser for the Federation for Repeal of the Levering Act.” The inscription on the pastedown is significant. Einstein is known to have endorsed the [successful] fight against having every California citizen/employee of the government pledge complete loyalty to the government no matter one’s political affiliations. This was called the Levering Act. These strictures to be imposed on California government employees took place during the McCarthy era of seeking out Communist sympathizers, including the banning of alleged Communist-leaning Hollywood actors and directors. Fine in a near fine dust jacket. Housed in a custom half morocco clamshell box. An exceptional association. 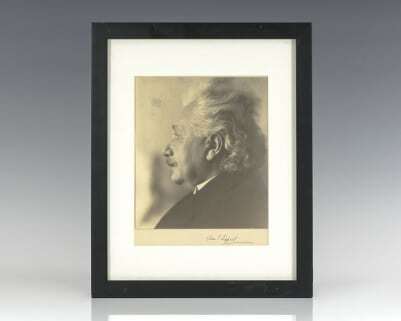 Engraved bust portrait of Albert Einstein by Hermann Struck. 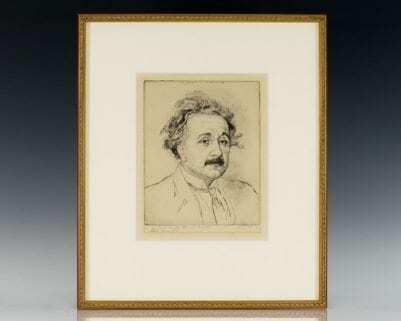 Signed at lower right by Albert Einstein and the artist Hermann Struck. 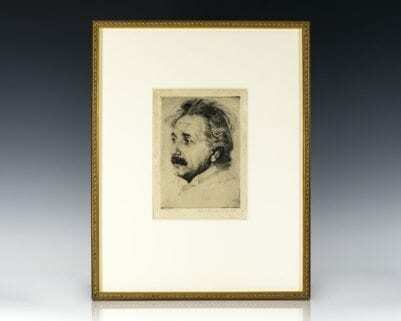 This was the artist’s proof and is cited by him writing (“proof”) on the lower right, in pencil, next to Einstein’s signature. 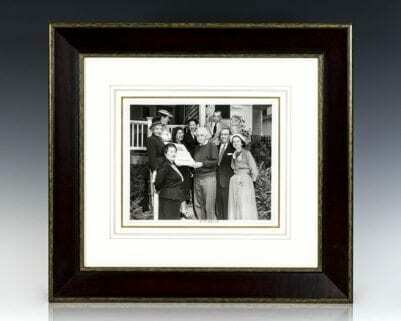 The engraving measures 7 inches by 10.5 inches. Matted and framed. The entire piece measures 16 inches by 20 inches. Rare and desirable. Evanston: Library of Living Philosophers, 1949. 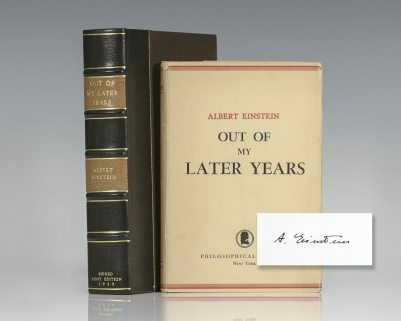 Signed limited first edition, one of 760 copies signed and dated “Albert Einstein ‘49.” Octavo, original brown cloth, top edge gilt, original slipcase. The book is in fine condition, the slipcase is in fine condition. Housed in the original publisher’s cardboard. An absolute pristine example, which has been stored in the original cardboard box since publication. Edited by Paul Arthur Schilpp. 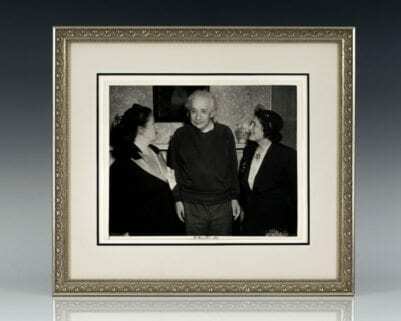 Frontispiece portrait of Einstein by Yousef Karsh. Rare and desirable in this condition. Albert Einstein: A Biographical Portrait. New York: Albert & Charles Boni, 1930. First edition of this Einstein biography. Octavo, original cloth, frontispiece of Einstein. Signed and inscribed by Albert Einstein on the front free endpaper and dated in 1931 with a four line unique poem in German entirely in his hand, which translates, “This life is bizarre and unsound It looks clearer written down the urgencies that in the dark are touched don’t frighten others very much.” The recipient was the wife of Leonor Michaelis, who was a German chemist, and physician, known primarily for his work with Maud Menten on enzyme kinetics and Michaelis–Menten kinetics in 1913. Fine in the rare original dust jacket with some chips and wear. Housed in a custom half morocco clamshell box. Rare and desirable.